Google announced that it will start punishing sites with intrusive mobile popups starting January 10, 2017. Given 1.4 billion smartphones were sold in 2015, it’s hardly surprising that 70% of internet use now comes via mobile devices. And with so much content viewed on phones, you can’t afford to ignore Google’s latest update. After all, from January 2017, pages that have popups on mobile may rank lower because of those popups. This is in line with what we’ve been seeing in the last few years from Google, taking mobile seriously with the Mobilegeddon update, the Google Index Divide, and more. Popups that appear immediately after clicking through to the site, or while users are scrolling. Interstitials that have to be dismissed before you can even reach the main content. Layouts that mimic a welcome mat, making the user scroll past an above-the-fold graphic before they can read the page. Google has included a few exceptions: Popups for legal reasons, verifying ages or notifying users about cookies, will still be allowed. Login boxes will also be accepted if the content beyond the login is private. That would include paywalls, or even email logins. After all, Google can’t index the content beyond the dialog box so there’s no need to penalize the site. 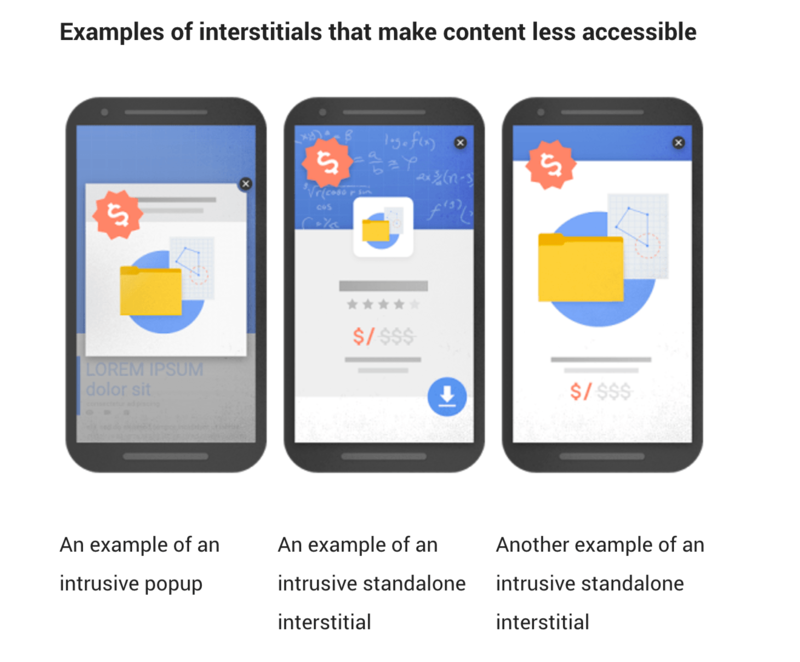 But if you use any of the interstitials that aren’t exempt, then you might be tempted to panic. Even Google ask that you don’t worry just yet. They explain that “intent of the search query is still a very strong signal, so a page may still rank highly if it has great, relevant content”. Making sure your content is valuable and worth reading is still a really important way toget pageviews. Part of Google’s mission is to prioritize good content in its search results. They want users to get the best results possible so that they continue to use Google as a search engine. They’ve tried to put users at the heart of their algorithms for some time. In 2014, Google added ‘mobile-friendly’ tags to websites that were optimized for mobile display. It was a good move as 48% of users reported feeling frustrated when they reached sites that weren’t mobile-friendly. But now that 85% of sites are mobile-friendly, Google has had to find a new way to prioritize the best content. That’s particularly true in the mobile space. In October, Google even announced that in future, their mobile index will be more up to date than their desktop index. So, what’s the issue with popups? One of the problems with popups is the fact that Google can still read and index the content of the page. Except the visitor can’t read it as soon as they arrive because there’s an interstitial in the way. While most popups have a ‘No thanks’ option, or an X to exit them, they’re still a barrier to the content. They can be annoying on a desktop computer, but even more so on a small mobile screen. You don’t want to try to touch a tiny ‘x’ only to find you’ve clicked on an ad, or loaded a video that might eat up your mobile data. So from January 10 2017, Google will not rank pages as highly if a visitor can’t easily access the content. 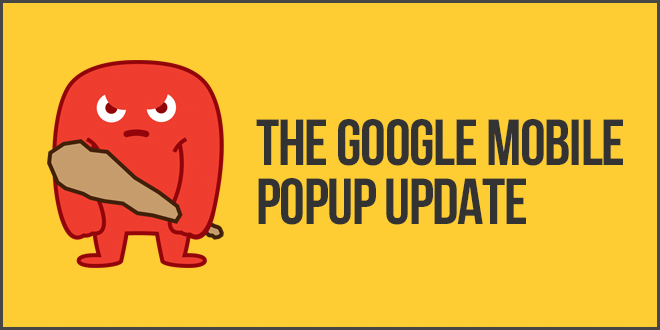 What do you need to know if you use popups for your email list? If you use popups to gain subscribers, then you’ll want to try and keep using them in some way. After all, one test even showed that a popup was a massive 1,375% more effective than a signup form in the sidebar! You can always try the ‘two step pop-up’. 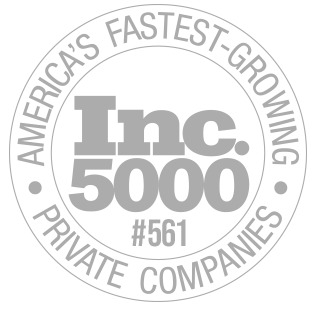 Simply add a call-to-action in your post. Only the visitors who click on your CTA will see the popup. The two-step opt-in can increase opt-ins by 60%. If you still want to use your usual popup, then make sure there’s a setting that allows you to turn popups off on mobile devices. That way you still target desktop users, but don’t fall foul of Google’s change. Some popup providers offer an alternative, in the form of the scroll box. The box only appears once the reader has read a certain percentage of the content, by which point they’re more likely to subscribe because they like what they’ve read. Plus, they don’t obscure the whole page as soon as the visitor lands on it – and that’s what Google is primarily looking at. We suggest making sure you nix any mobile popups before January 2017 to prevent any rankings loss. Keeping signup forms on the site in the post footer or throughout the content will be the best way to make sure you keep getting subscribers from mobile devices. We won’t know how serious this update will be until it actually rolls out and we will keep you up to date, as always with any new Google updates. Really important information about coming up dates. I can totally understand why Google is doing this as I personally find pop ups on mobile – wellmyes – very annoying. So good on Google ! Can google penalize for social lockers WordPress plugin? No, why would they do that? The social locker has nothing to do with popups. Very good initiative by Google. Forget marketing and promotion, its very annoying to see too many popups while visiting any site. In reality it is downgrading the user experience. And worth mentioning, this post is very informative and very well written. Thanks for sharing. I completely agree with you. It is really irritating to see too many popups. Great approach by Google. Does this include pop ups triggered by an intent to leave? That sort of pop up (in theory) is there after content is consumed. I would suggest just getting rid of all popups on mobile. Pop-ups resemble that desperate car salesmen, stalking you the minute they see you drive up the lot. Such a deterrent for a good user experience. Give people a chance to read your content and don’t do such hard sell.